A rare weekend without the kids means we can wander around the Glasgow International Festival of Visual Art at our own relaxed pace. My art student other half is the expert; I’m going along as the clueless admirer. Glasgow School of Art is our first stop where we’re welcomed by the colourful set of Folkert de Jong’s The Immortals figurative sculptures. Inspired by Charles Rennie Mackintosh and his Margaret MacDonald Mackintosh, the work is uplifting, smile rousing – and the female sculpture has something mischievous about her. Go on, take a look. 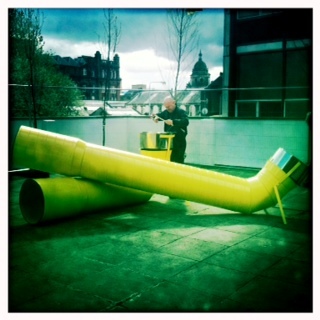 Next it’s onto the Dialogue of Hands at the City of Glasgow College, an outdoor sculpture park for children and adults. Having no children with me, I throw caution to the wind and freely climb inside odd shapes and balance along installations. Favourites include the big yellow tubes with kettle-like drums at the end, complete with drumsticks. My husband is lost in his musical world bashing away when a woman scolds him for ‘banging too loudly’. Mood killed, we leave. But I encourage everyone see this imaginative, interactive piece – and bang the drums loudly. That’s what they’re made for. 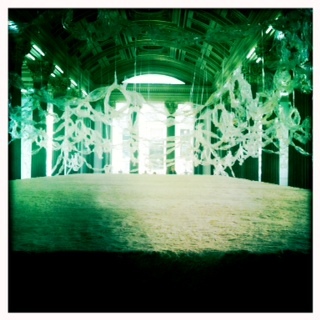 I want to take a running leap right into the middle of Karla Black’s amazing installation at GoMA. This magical must-see brings you into a world of huge, layered rectangles of sawdust with taped circles dropping from the ceiling daubed with bronze and gold. It’s like walking inside a circus tent waiting for trapeze artists to appear. And around the edges scooped out holes appear in the sawdust with little creatures on the ground – as if they’ve burrowed out. Fantastic. The festival spreads across the city from the West End with Wolfgang Hillman’s work, to the East End where you can bounce on Stonehenge and your chance to appear in a film in The Making of Us on the South Side. This imaginative festival only happens once every two years – so don’t miss the many visual spectacles happening around the city until 7 May. This entry was posted in Glasgow International Visual Arts Festival and tagged Art, GI festival, Glasgow events, what to do in Glasgow. Bookmark the permalink.